Water Generating Systems (WGS) develops highly efficient atmospheric water-generating units for military and mobile applications. These can be deployed wherever mobile or stationary water supplies are required, including military and government environments. Our mobile systems are able to contain their own fuel storage and power supply, and can be containerised to rapidly deploy a fresh supply of drinking water and local emergency power for critical unit communications. The WGS atmospheric water harvester (AWH) uses existing refrigeration technology with advanced control systems to condense water vapour from the air to produce fresh, safe and cost-effective drinking water with no harmful waste. Powered by grid, generator, or solar electricity, AWH units can be operated easily and intuitively with a simplified user interface. Under typical atmospheric conditions, commercial units are able to produce up to several hundred litres of pure drinking water each day. The AWH is best suited to hot / humid climates and regions where there is a lack of sufficient drinking water. There are two WGS Commercial AWH product models: (1) the WGS-900 is a stand-alone unit that can serve as either a stationary or mobile atmospheric water generator, while (2) the WGS-900i is an integrated stationary unit designed to work in conjunction with new or existing HVAC building systems. The WGS-900 commercial standalone unit comprises components and materials designed to offer long-term reliable service in adverse weather conditions. It can generate more than 200 gallons of pure potable water a day at an ambient air temperature of 80°F and 60% relative humidity (RH). Its unique configuration enables air to be efficiently processed and removed, simultaneously minimising overall unit size and moving parts. The WGS-900 uses advanced control methods to minimise energy usage when water production conditions become less desirable. Both units can be installed at a new property or retrofitted for integration with an existing water chiller. They significantly reduce energy costs and allow for a notable reduction in capital costs, as well as enable commercial properties to more effectively meet stringent environmental regulations. The WGS-100 residential standalone atmospheric water harvester (AWH) unit with reclamation is a single, enclosed unit located outside the home on a slab with plumbing leading inside for usage such as drinking water and food preparation. It also can be used independently with only a power connection, and may be programmed for operation during suitable periods for optimum efficiency and energy cost savings. The WGS-100 unit features a water purification and storage system that can be fitted into a home plumbing system. The WGS-100c residential combination AWH / ventilation and air conditioning (HVAC) system unit is integrated into the home plumbing system by replacing the existing compressor and condenser located outside with a HVAC / AWH unit assembly combination. This integration increases efficiency and reduces the total amount of energy consumed, as well as reduces the total capital costs of installing both AWH and HVAC systems. 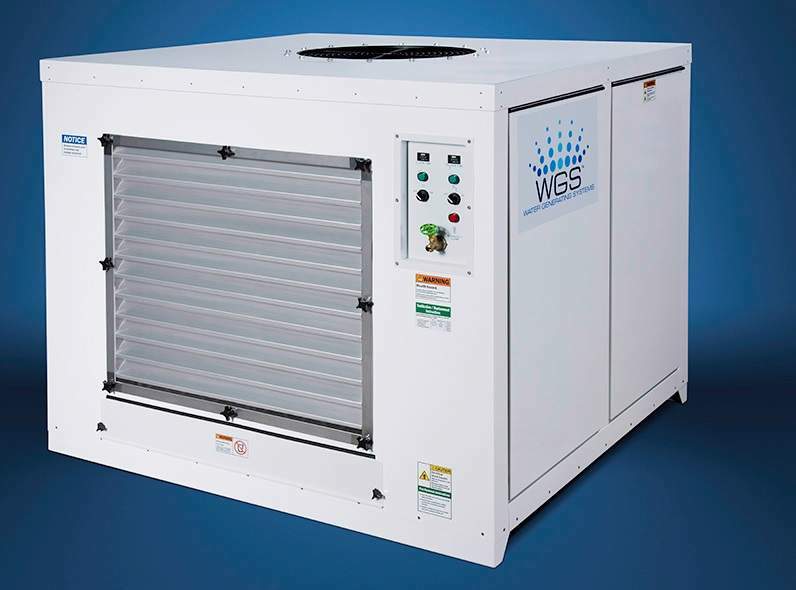 WGS-100c’s service life meets or exceeds that of other HVAC units. It is available in a range of sizes to cater for the HVAC, as well as specific water needs of various housing locations such as apartment complexes and single family residences. The WGS-100c produces between 50 and 70 gallons a day of pure potable water at an ambient air temperature of 80°F and 60% RH. Washington, D.C.-based Water Generating Systems delivers optimal AWH solutions for water sustainability. Originally developed with US Department of Defense (DoD) and private funding, the AWH is the world’s most advanced technology in its field. WGS is a primary product developer and well-regarded contractor for the US Navy and US Department of Homeland Security. The company was awarded four grants at a total of $19.1m by the US DoD: the Defense Advanced Research Projects Agency (DARPA) and the Office of Naval Research (ONR).